Mikrotik RJ45 SFP copper module 10 Mbps, 100 Mbps, 1 Gbps, 2.5 Gbps, 5 Gbps, 10 Gbps with auto negotiation. 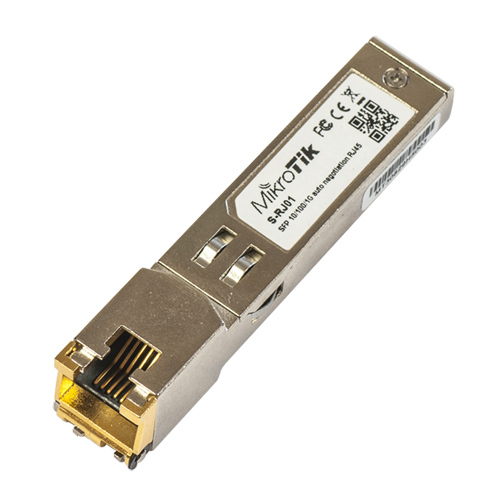 This unique module opens up a whole world of high speed connectivity possibilities, offering up to 10 Gbps speeds over regular familiar twisted-pair cables in your existing products that have SFP+ ports. Any MikroTik device that has SFP+ ports can now be used without installing any optical fiber, just plug the S+RJ10 and your network can be upgraded to 10 Gbps, making it ready for the next generation of RJ45 hardware..